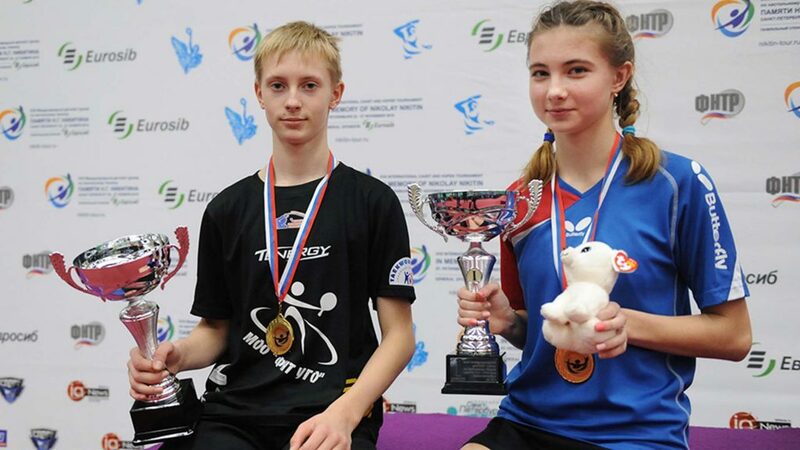 Stars of the were Sergey Ryzhov and Anastasia Beresneva, both from Nizhny Novgorod, they won the respective Hopes Boys’ Singles and Hopes Girls’ Singles events; not only did they secure the top step of the podium in their own group, both gained places on the medal podium in the higher age group category. Sergey Ryzhov reached the semi-final stage of the Cadet Boys’ Singles event, Anastasia Beresneva progressed to the same round of the Cadet Girls’ competition. In the Hopes Boys’ Singles event, Sergey Ryzhov accounted for Moscow’s Vsevolod Idin (14-12, 11-8, 11-5), prior to securing the title at the final expense of Orenburg’s Vladislav Bannikov (14-12, 4-11, 11-7, 11-6). In the opposite half of the draw, in the penultimate round, Vladislav Bannikov had beaten Miron Vasiliev from Sverdlovsk. Later in the Cadet Boys’ Singles event he reached the semi-final stage eventually losing to the champion elect, Anatoly Smirnov (11-6, 9-11, 11-8, 11-7). Success for Anatoly Smirnov against Sergey Ryzhov was to be anticipated; however the victory recorded in opposition to the host city’s Stepan Pokatov in the final (11-9, 9-11, 8-11, 11-9, 12-10) was not to be predicted. Stepan Pokatov was the top seed. One round earlier in order to book his place in the final, Stepan Pokatov had beaten Kazan’s Sergey Zagoskin (11-5, 11-8, 11-8). Likewise Anastasia Beresneva was in outstanding form; she beat Ekaterina Belousova, also from Nizhny Novgorod in the final of the Hopes Girls’ Singles event (11-9, 10-12, 7-11, 11-4, 11-5), having at the semi-final stage ousted Orenburg’s Vasilisa Danilova (11-2, 11-8, 11-8). In the counterpart penultimate round duel, Ekaterina Belousova had beaten Karina Yusupova (11-7, 11-6, 5-11, 11-7), like Vasilisa Danilova from Orenburg. Victory meant a place was reserved in the Cadet Girls’ Singles event; in both the Hopes Boys’ Singles and Hopes Girls’ Singles competitions, the top 16 players gained places in the higher age group. Just as with Sergey Ryzhov, Anastasia Beresneva reached the penultimate round, losing eventually to the winner, Samara’s Valeria Kudinova, the top seed (12-14, 11-5, 11-2, 11-6). A testing semi-final contest, the final was even more exacting for Valeria Kudinova; she had to recover from a two games to nil deficit to beat St Petersburg’s Yulia Lubushkina (7-11, 7-11, 12-10, 11-9, 11-7). One round earlier Yulia Lubushkina had accounted for Volgograd’s Alina Zavarykina (11-8, 11-6, 11-6) to reserve her place in the final. In addition no less than 18 Russian regions being represented, players from Armenia, Belarus, Estonia and Moldova competed. Overall 246 players competed. There were 58 entrants in the Hopes Boys age group, 60 for the Hopes Girls; whilst in each of the Cadet Boys and Cadet Girls’ age groups there were 64 participants. 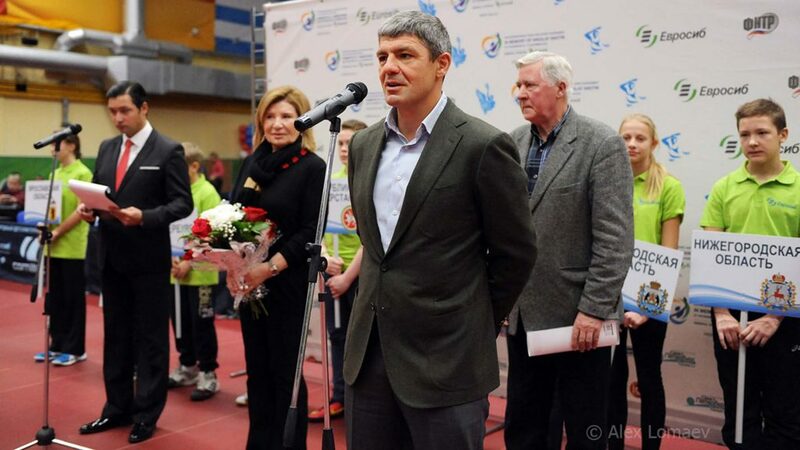 Supported by Eurosib, play was conducted throughout in the Kometa Sport Hall; matters concluded with Dmitry Nikitin, the son of Nikolay Nikitin and President of Eurosib inviting everyone to St Petersburg next year.